All University Interscholastic League (UIL) member high schools in good academic and athletic eligibility standing will be included for contention. The UIL is based on the premise that students are students first, and participation in activities is a privilege. Any member school that is found to be in violation of UIL rules for any portion of the school year will be subject to penalties as governed by the UIL. 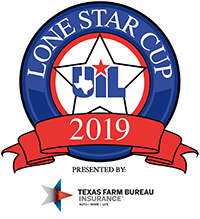 Any athletic, academic or other competition not specifically listed above will not be included in the UIL Lone Star Cup standings. If a school ties for a place in overall team standings of a contest (or for overall match wins in Tennis), the points will be added up from all places effected by the tie and split evenly between the tied schools. Example: Two schools tie for 4th place in state Track & Field. Points for 4th place (4 pts) and 5th place (2 pts) are added together and split evenly between the two schools (3 pts apiece). A high school's rank in a state or national poll will not count in the UIL Lone Star Cup standings. All points are based on a high school's finish in the championships for the aforementioned UIL-sanctioned sports and activities. Standings will become final July 1, 2019. Standings will be publicized on the UIL Website. Tabulations will be verified and maintained by the University Interscholastic League. All publications of standings are official but will be subject to correction if necessary. If a member high school finds the standings or points totals to be incorrect, please contact the University Interscholastic League at pr@uiltexas.org. Corrections can be made upon verification throughout the school year, but the final standings cannot be altered after July 1, 2019.